Pollock, who joined Northampton in September, was a central figure in the success of Town’s youth team earlier in the season when they won the EFL Youth Alliance South East Division and also pushed Arsenal close in the FA Youth Cup. The manager has been great for the young players. He’s given me an opportunity and I was pleased I was able to show him what I could do and glad we got the result. The 18-year-old was rewarded with a place on the bench for January’s trip to Cambridge United, and injuries to Keith Curle’s depleted squad saw him get his first taste of first-team action at the Abbey Stadium, introduced as a 44th minute substitute. 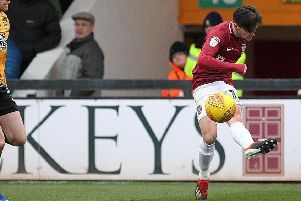 Pollock made his full debut against Mansfield Town on Saturday, following in the footsteps of Jay Williams and Ryan Hughes this season, and all three players are among the seven to have won professional contracts at the Cobblers. With four games left this season and little to play for, Pollock and co will now be eyeing more game-time. “With seven of the academy team signing on this year the future looks really good for us,” said Pollock. “Hopefully now we can finish this season well and then make a good start to next season. “The manager has been great for the young players. He’s given me an opportunity and I was pleased I was able to show him what I could do and glad we got the result (against Mansfield). “They needed the points a lot more than us because they want to go up but we did really well and battled really well against a tough team and an experienced team. 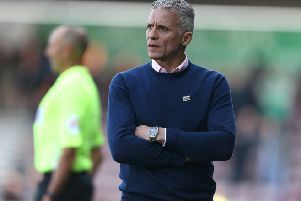 After impressing on debut, Pollock should be in contention to feature again on Good Friday when the Cobblers host relegation-threatened Macclesfield Town.